With the war with Mexico looming, Pierce again finds himself caught between loyalty for his family and his devotion to his country. At the outbreak of the Mexican War (1846-1848), New Hampshire was called upon to provide a brigade and Pierce enlisted in the army as a private but was quickly promoted to colonel. In March 1847, he was appointed brigadier general of volunteers and took command of a brigade. On the August 19, 1847, the battle of Contreras was fought. Seven thousand Mexican troops occupied a heavily entrenched camp which required the advancing Americans to cross the lava bed of an extinct volcano, which was strewn with sharp rocks. The terrain afforded the Mexicans cover and made attaining a steady foothold difficult for soldiers and horses alike. The American army was led by General Winfield Scott whose plan was to divert the attention of the Mexicans by feigning an attack on the front, while the bulk of American forces would flank the Mexicans and cut off their retreat. Four thousand volunteer recruits led the frontal assault including Pierce and his brigade. The flanking troops were heavily delayed and the attacking Americans were in a desperate situation as they fought the much larger and better trained Mexican army. General Pierce’s horse stepped into a cleft between two rocks and broke its leg, throwing Pierce who badly injured his knee. Pierce refused to leave his troops and stayed on the battlefield until nearly midnight. As he reentered the saddle at daylight, the flanking forces finally attacked the Mexicans routing them. Despite General Scott advising Pierce to leave the field, he refused. Pierce’s brigade and that of General James Shields were ordered to attack the Mexican reserves from the rear. Again heavily outnumbered, the two American brigades engaged in a bloody struggle before the bulk of the American army relieved the pressure of overwhelming numbers. When his steed was unable to traverse a ravine, Pierce dismounted and attempted to proceed on foot, only to sink to the ground in pain. He again refused to be taken from the field until victory was assured. 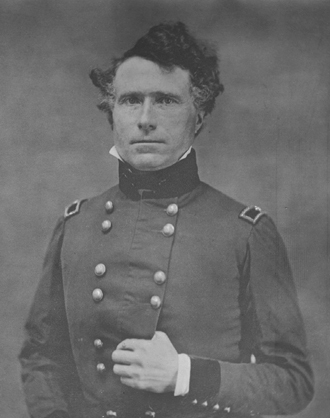 Upon the end of the war, Pierce resigned his commission and returned to Concord and his family. During the war he demonstrated a great deal of personal bravery and loyalty to his men that won him great admiration. In the following years, Pierce devoted himself to his law practice and his family. Nationally the issue of slavery was threatening to tear apart the Union, until the passage of the Compromise of 1850. The Compromise defused a four year confrontation between the slave states of the south and the free states to the north. The conflict arose from the expectation that the United States would expand its territories following the Texas Annexation and the Mexican War. 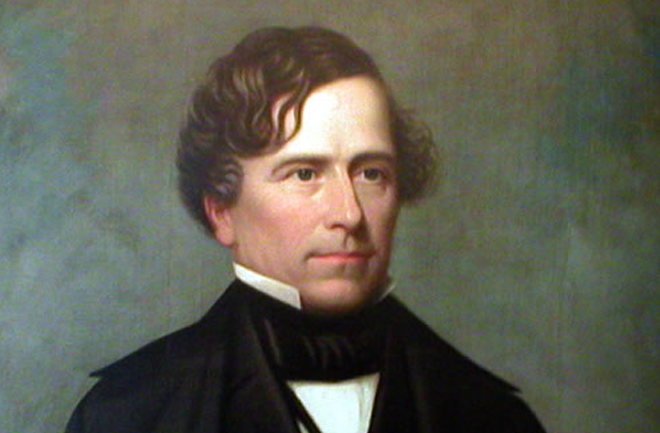 At the Democratic national convention of 1852 which was convened in Baltimore, there were four strong contenders for the Democratic nomination; James Buchanan, Stephen A. Douglas, Lewis Cass, and William L. Marcy. Such was the support for each of these candidates by the 35th ballot no candidate had pulled ahead of the field. The Virginia delegation then brought forward Pierce’s name in an attempt to break the deadlock and on the 49th ballot Pierce received the Democratic nomination for President. Little is known about Pierce’s personal opinion at the time although there is little doubt that his nomination would not have been welcomed by his wife. 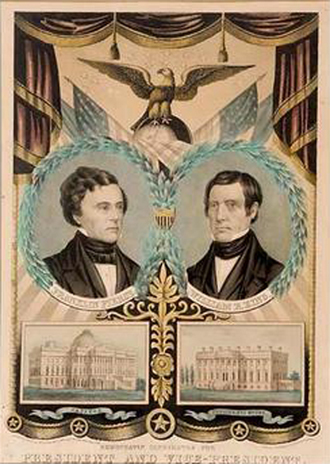 Following his nomination as the democratic candidate, Pierce faced his former commanding officer, General Winfield Scott, the Whig party candidate, in the 1852 Presidential Election. The Compromise loomed large in the election and with Democratic support for the compromise seen to be greater than that of the Whig Party and with Scott’s anti-slavery views hurting him in the south, the tide was with the Democrats. With little else between the parties, Pierce’s more affable personality proved decisive and he received 254 Electoral College votes to Scott’s 42. In just a few short months, Pierce was to be sworn in as the 14th President of the United States. In the final article in this series, we discover how Pierce’s ascendency to the presidency was marred by family tragedy.